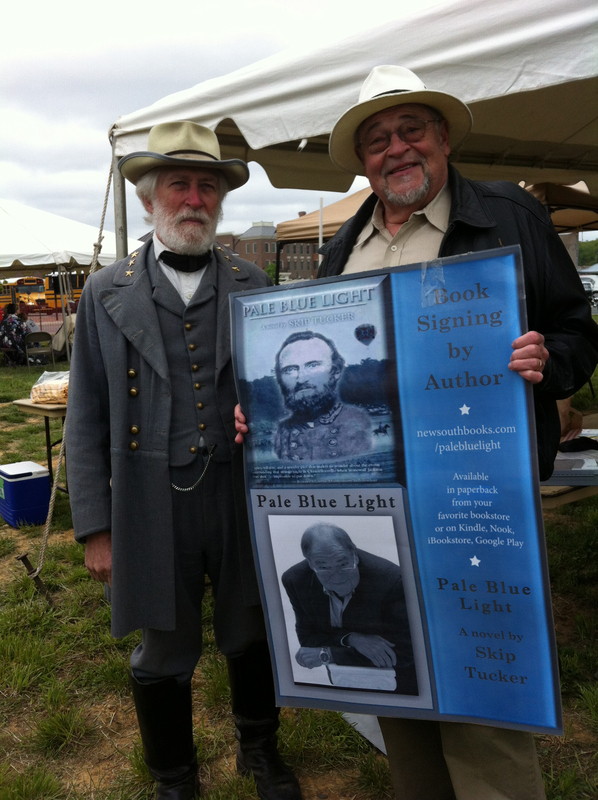 Author Skip Tucker missed meeting General Stonewall Jackson by 150 years, but while traveling to promote his novel Pale Blue Light, Tucker might’ve encountered the next best thing. While talking about his book at the annual re-enactment of the Battle of Chanellorsville in Virginia, Tucker took the time to pose with a Jackson impersonator, as well as a host of men and women in period dress there to commemorate the 150th anniversary of the battle. Skip Tucker and Stonewall Jackson at the Battle of Chancellorsville. That event, at the Fredericksburg and Spotsylvania National Military Park, was just one leg of Tucker’s 1,500-mile journey that included stops in the Shenandoah Valley, Atlanta, and New Orleans. 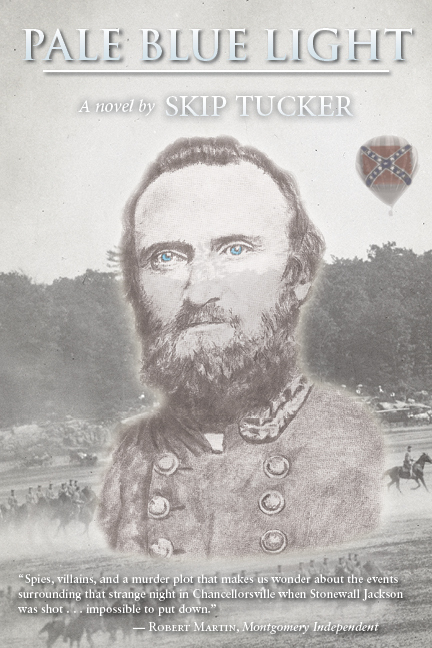 At each stop Tucker has been sharing with readers his unique Civil War spy thriller Pale Blue Light, in which Tucker suggests Stonewall Jackson’s death by friendly fire might not have been as clear-cut as it seemed. Book industry journals Publishers Weekly and Shelf Awareness each took notice of Tucker’s trip and spoke with NewSouth publisher Suzanne La Rosa about the book. at the Battle of Chancellorsville. Read the Publishers Weekly and Shelf Awareness articles at their websites. Skip Tucker’s Pale Blue Light is newly available in paperback and also as an ebook from NewSouth Books, Amazon, or your favorite bookstore. 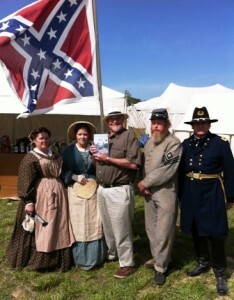 Alabama author Skip Tucker leaves shortly on a 1,500-mile drive to promote the national paperback release of his historical adventure novel, Pale Blue Light, at the annual re-enactment of the Civil War’s Battle of Chancellorsville, Va., May 3-5. The trip is timed to coincide with the 150th anniversary of the death of Stonewall Jackson and the historic battle. Some 30,000 people are expected to attend the commemorative events. Tucker will hold an 11 am news conference on May 4 at the Spotsylvania County Museum at the Chancellorsville Battlefield to announce the book release. Gen. Thomas “Stonewall” Jackson, a central figure in Tucker’s novel, was wounded at the May 2 battle and died of pneumonia May 10. “Pale Blue Light” is a lesser known nickname for Jackson, whose pale blue eyes would seem to shine with light from adrenaline before a battle. Tucker says Jackson is a particular hero of his. Strong sales of the first edition hardcover, including several sell-out Costco events — which the author helped promote superbly via Facebook and in the print media — encouraged NewSouth Books in the release of the book in trade paper. Chancellorsville will be the first major stop on Skip Tucker’s national roll-out tour that will include stops in the Shendandoah Valley, where “Stonewall Jackson is a superstar,” Atlanta (at the Georgia History Museum), and New Orleans (at the Confederate Memorial Hall Museum). “This is really an exciting time for me,” said Tucker. “I intend to rough-camp along the way and follow the trail, sometimes, that Jackson took in his historic campaign through the Shenandoah Valley. Read the press release for Pale Blue Light. For more information about Pale Blue Light, Skip Tucker, or his book tour, contact Lisa Harrison at NewSouth Books, 334-834-3556. Pale Blue Light is available in paperback and ebook from NewSouth Books, Amazon, or from your favorite bookstore. You are currently browsing the archives for the Pale Blue Light category.